Addiction to methadone is a controversial topic. Most methadone treatment supporters and non-supporters agree that there's no doubt that methadone is highly addictive. However, this may be where the agreeing ends and the arguments begin. Methadone is a drug used primarily to treat heroin addiction, although it is occasionally used to treat very severe pain. What surprises some people is that methadone and heroin are actually of the same classification of drugs - opiates. 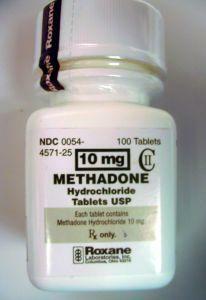 Methadone is a synthetic opiate. Additional methadone classifications or definitions you hear may include Dolophine, the name it was first marketed under, and narcotic analgesic. A narcotic analgesic, like methadone, provides pain relief by acting on your central nervous system while a nonnarcotic suppress pain via pain receptor sites. Methadone is very addictive. Because it works on the central nervous system, an individual's brain can become too well adjusted to relieving pain by means of methadone versus using natural painkillers called endorphins. Everyone has naturally produced endorphins that will help to cut pain. When these become deadened or degenerated due to narcotic use, however, an individual will seek outside pain relief through the continued use of the narcotic. You can build up a tolerance to the drug. When you stop taking the drug you'll have withdrawal symptoms. When someone quits methadone abruptly, it can result in intensified withdrawal symptoms. The slower someone quits methadone, the easier the process is. This is usually done by weaning an individual slowly off using carefully monitored lower dosing over a decent amount of time. The other issue related to methadone addiction are the symptoms someone can experience while actually taking the drug. Not only is addiction to methadone common but so are the side effects. All narcotics generally have the same sort of side effects. A major issue of narcotics is that way they treat pain and suppress drug cravings. Narcotics like methadone suppress pain well and can suppress the need for a drug like heroin. Unfortunately, they also have the ability to suppress other nervous system functions such as respiration and coughing. Some narcotics are worse than others. Methadone can suppress your ability to breathe normally. In fact, individuals with asthma, sleep apnea and other breathing issues should use another treatment for heroin addiction. Other side effects can include stomach problems, constricted pupils, impaired judgment, and overdose. Usually individuals on methadone are advised not to drink alcohol because it can increase side effects and the occurrence of overdose. If Addiction to Methadone Is Prevalent, Why Use It? Many are worried that methadone addiction may be far worse than a heroin addiction. A quick look around the Internet will show that there are many drug addition treatment forums full of individuals who complain that kicking heroin was easy compared to quitting methadone. On the other side, are methadone supporter who argue that the side effects of heroin outweigh any potential negatives of methadone. The benefits of methadone are clear - it can manage a heroin addiction. Methadone provides relief from heroin cravings, but does not provide the rush that heroin does; thus decreasing the likelihood of erratic behavior. Another benefit is safety. Methadone is taken orally and the dose is usually carefully monitored by a doctor. As far as heroin goes, there is no doctor involved. Since heroin is taken using needles, the spread of other diseases is a real risk for users. Research shows that heroin users are far more likely to be incarcerated than methadone users. The difference between a heroin addiction and a methadone addiction is that individuals addicted to heroin tend to participate in illegal or disruptive behaviors. On the other hand, methadone is legal and causes less disruption to society. What Can Help Methadone Addiction? There's plenty of research that reports that coming off of methadone may not be as hard as some say if the weaning off is handled slowly and carefully. The Methadone Briefing offers interesting research about methadone that may be the key to lowering the stigma of meth addiction. The briefing notes that when individuals actually feel more anxiety ridden about withdrawal from methadone the clinical symptoms are far worse. With constant therapy some of these anxiety aspects could be lowered and withdrawal wouldn't be a bad. Participation in a group like Narcotics Anonymous can help as well. For excellent coverage of methadone such as background, treatment methods, safety, and a huge bibliography visit the Drug Policy Information Clearinghouse Fact Sheet on Methadone.